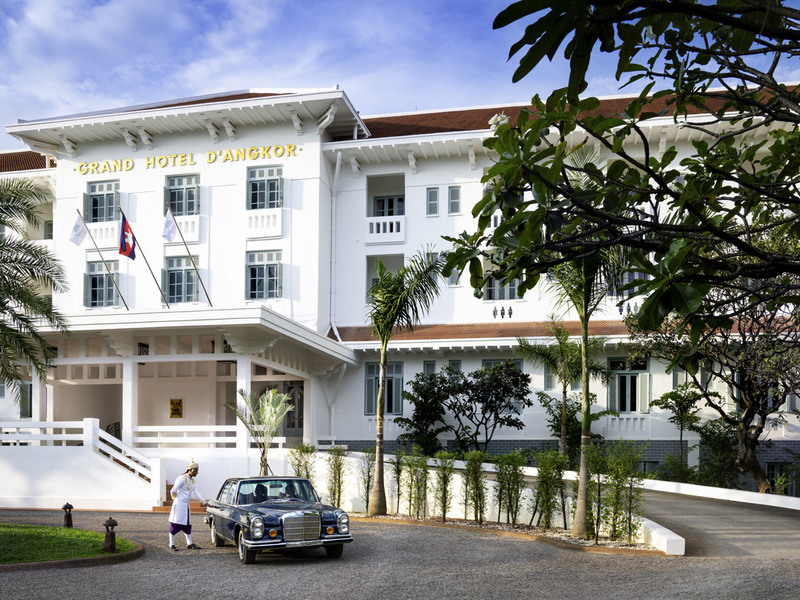 Set across from the Royal Palace is one of the landmark historic hotels of the legendary Grand Tour of Indochina. Raffles Grand Hotel d'Angkor first opened its doors in 1932 but the legend lives on today after careful restoration. The hotel is rich in Cambodia history and full of original treasures right down to the original working cage elevator in the lobby. Our doorman still welcomes everyone in a uniform inspired by the Royal Palace. With the privilege of over 15 acres of beautifully landscaped French gardens and built around the country's largest swimming pool, the hotel is a peaceful oasis where to retreat after exploring the temples in the UNESCO World Heritage site (only 10 mn). Raffles Grand Hotel d'Angkor, Siem Reap will be closed for restoration from May 1st, 2019 until September 30th, 2019. Raffles Grand Hotel d'Angkor epitomises Cambodian charm and elegance. Each of the spacious 119 guestrooms, suites and villas are tastefully appointed with Cambodian object d'art style furnishings some retained from when the hotel opened its doors in 1932. Every room has stunning views of either the magnificent pool or the expansive gardens and many boast balconies to take in the view and fresh air. Situated in the serene gardens and surrounded by traditional Cambodian boundary stones with majestic wooden gates at the entrance, the Apsara Terrace is a 'must-do' experience in Cambodia. Enjoy a majestic performance with Cambodian dances. Home to our signature champagne breakfast, the restaurant is open for lunch and dinner with Asian and Continental dishes created to offer the best of both worlds. Enjoy alfresco dining on the patio overlooking the pool or relax inside the café. The restaurant showcases Royal Khmer cuisine and Western fine dining. The ancient Royal Khmer cuisine has been handed down over centuries by the chefs of the Royal Palace. The finest ingredients are blended to create a distinct gastronomic experience. Siem Reap's most celebrated bar. No visit to Raffles Grand Hotel d'Angkor would be complete without our famous signature cocktail, Airavata, a delicious blend of rum, coconut passion, lime juice, crème de banana and pineapple as well as coconut juice. Surrounded by fragrant Frangipani trees, this is the perfect spot for light meals in the day or cocktails by the pool. The menu also features a selection of Raffles Spa dishes for the more health conscious. A wonderful colonial atmosphere overlooking the pool and gardens, best known for the traditional afternoon tea. Enjoy an evening cocktail or aperitif accompanied by our talented pianist.